Influenza control: do we need a shift in our thinking? The National Advisory Committee on Immunization recommends “influenza vaccination for all individuals aged six months and older” in Canada. But what is the evidence for universal programs? In this webinar, Dr. Richard Schabas (Chief Medical Officer of Health for Ontario from 1987-97, now the Medical Officer of Health for the Hastings & Prince Edward Counties Health Unit) explored this question, including the impact and implications of new research. Personal cultivation as described by the proposed Cannabis Act (2017) will permit adults to cultivate up to four cannabis plants per household. This provision is intended to both promote equity by facilitating access to legal cannabis, particularly when retail outlets are difficult to access, and to undercut the black market. However, indoor cultivation and processing of cannabis may also introduce or exacerbate certain environmental health risks in the home. This document identifies health and safety concerns that may be relevant to personal cultivation after legalization – that is, legal home growing and the associated health risks. Although this information may be of relevance to the public at large, the evidence presented here has been synthesized and organized for policy- and decision-makers, environmental and medical health officers, and other public health professionals. This review thus serves as a launching point for considering both wide-scale and regionally oriented preventive actions to mitigate the environmental health risks that may arise from growing at home. Is School Closure and Effective Way to Control Influenza? Closing schools seems like a logical approach to managing community outbreaks of influenza. First, school-aged children are among the age groups more susceptible to influenza infection. Second, they tend to shed more of the virus into their environments, increasing the risk of exposure for those around them. Third, they live, learn, and play in close contact with many others – classmates, friends, teachers, family members, and caregivers. As a result, limiting contact among school-aged children should, in theory, reduce the spread and lessen the impact of pandemic or seasonal influenza, both among children and in the broader community. In practice, however, the effectiveness of school closures for managing outbreaks or severe outcomes related to influenza is unclear. Research on school closures has sometimes lacked rigour, often led to contradictory findings, or been insufficient to answer some of the more important questions. This paper is the second in a series of papers focused on anti-Aboriginal racism in Canada. It focuses on the lived and structural forms of racism and provides a brief overview of what racism is, how it intersects with other forms of discrimination, and how it is manifested. The paper examines how the dominant racialized group (i.e., European settlers) expresses racism in historic and current contexts and how Aboriginal people in Canada experience racism in interpersonal, structural and sometimes violent ways. 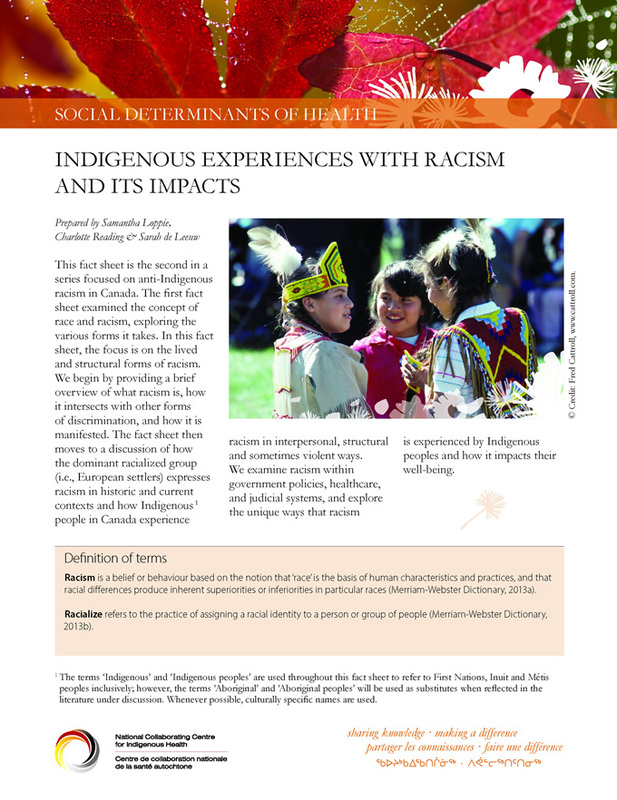 Government policies, healthcare, and judicial systems are also explored for the unique ways in which racism is experienced by Aboriginal peoples and how it impacts their well-being. A look at the purposes of Partner Notification. Are there standards for Partner Notification? Who is responsible for Partner Notification? How is Partner Notification done? Which is the “best” approach to Partner Notification? What’s next in the field of Partner Notification? The document provides an overview of recent literature and evidence for the potential health benefits, costs, as well as ethical considerations of school closure during influenza outbreaks. Constructing a Logic Model for a Healthy Public Policy: Why and How? This document outlines the process for constructing a logic model as proposed in the NCCHPP's method for synthesizing knowledge about public policies. It also shows the use of this type of logic model in applications other than knowledge synthesis, as a tool that public health actors can use to analyze public policies. This tool was created to help public health managers and planners make decisions about local programming priorities. Public health decision-makers who want to incorporate high quality evidence in their programming can use this tool to help determine whether a policy or program is relevant or feasible.